Task 1 - Study the diagram below carefully. It represents how land is normally (not always) used in LEDC/NIC's. The different zones represent what is normally found there (i.e. how the land is used). Task 2 - Take a tour of the four different locations in Rio, Brazil. Try to identify which of the zones each place represents. Take a tour along the road, look up, look to the side and get an idea of what life is like. Take a screen shot of a memorable view that you see and then write an account of that zone in less than 50 words next to the screenshot on your worksheet. Objective: To find out why people move to Rio de Janeiro in huge numbers and the impacts that this has on the megacity. Task 1 - The location. Watch the YouTube video and then study the Google map below to write a detailed description of the location of Rio and also our focus area, Rocinha. a. Define a shanty town and explain the two different types that exist. b. In less than 50 words, explain how these settlements have grown since the 1980's. 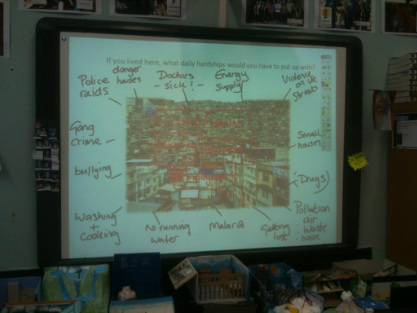 c. Create a sequence or flow diagram to show why shanty towns like Rocinha grow rapidly. d. Make a list of five possible locations that you may find shanty towns. Think carefully about land values and accessibility. a. Download/print then read the document to the right and save to your GCSE Geography folder - Shanty Towns. b. Open this worksheet and try to include three bits of information in each section of the table. You may copy and paste individual bits from the article and use information from the Ross Kemp video too. c. Read this BBC news article about the 2014 World Cup. Why are the government so concerned about this particular favela? Why do they want to improve it? Spend 24 minutes watching the documentary to the right on YouTube. 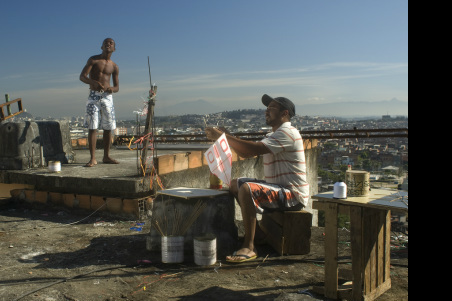 Take notes on the key aspects of the Favela Clearance Programme in Rio. To what extent does the 2014 World Cup benefit local people in Rio? Examine the issue from at least two different viewpoints. Interactive Study: Find out how about the four stages of a shanty town and research the three case studies below and take notes in your work book. Click here for an animation to show you about the stages of development of a shanty town. Make notes on each of the four stages in your workbooks. Task 2 - Choose one of the following and research it further. Case study outline is here. Case Study 1 - Favela Tourism - Visit this site and write about the ways in which the people of Rocinha are trying the improve their lives. How do 'Favela Tours' help them to achieve this? Case Study 2 - Pacification Programme. Click on the link to find out what the pacification programme is and how military action, new schools and a cable car have helped. Case Study 3 - ABC Trust - Take notes on how this organisation works to improve the standard of living and conditions for residents in favelas in Rio. Thanks to Kevin Cooper as I have used extracts of his lesson here. Study the PowerPoint to the right. It gives you a run-down of the main issues surrounding rural to urban migration as well as shanty town growth. Interactive Virtual Visit to an Indian Shanty Town.